There was a time whenever singer/songwriter/songbird June Deniece “Niecy” Williams would put out an album, I had to have it. As I look through my vinyl, I have 11 of her albums dating from 1976 – 1988. This Is Niecy, her debut album, was released in 1976 and featured the hit songs “Free” and “That’s What Friends Are For.” The songs “Cause You Love Me, Baby” and “If You Don’t Believe” were also favorites on this album, which was produced by Maurice White and Charles Stepney. The album cover itself is a classic and you can definitely hear the EWF influence backing her sparrow-like voice. “Free“, which she wrote, is still quite popular on the smooth jazz and quiet storm radio stations almost 30 years later. This song celebrated her freedom and new beginnings as a solo artist after several years of singing in Wonderlove, Stevie Wonder’s backing band. Her next album, Songbird, yielded the R&B hit “Baby, Baby, My Love’s All For You” and my favorite “Niecy” song “God Is Amazing.” She sang up to the heavens on this gospel gem. The Gary, Indiana native has had many hits throughout her sterling career including her duet with Johnny Mathis on “Too Much, Too Little, Too Late” and her solo hits “I’m So Proud“, “I’ve Got The Next Dance” (a disco favorite), “Let’s Hear It For The Boy“, “I Found Love“, “When Love Comes Calling“, “It Gonna Take A Miracle“, “Silly“, “My Melody” and “Black Butterfly.” I enjoyed some of her lesser known songs like “The Paper” and “Strangers.” She has also had a successful gospel career with duets on “They Say” with both Phillip Bailey (my favorite) and Sandi Patty and solo recordings of “Whiter Than Snow“, “Healing“, “So Glad I Know“, “My Soul Desire“, “I Surrender All“, and “Blessed Assurance.” By the way, if you have liner notes to the I’m So Proud album, you will notice in the lyrics of “They Say” it says, “That His love would set cactus free” instead of “captive.” No matter what she sings, she gives 110% of herself. In recent years, Niecy has starred in several gospel plays and hosts her own gospel show for BBC Radio 2 in London. In 2003, she also successfully launched “The Deniece Williams Show” a weekly gospel talk show on KKLA in Los Angeles. Continued blessings to this wonderful sparrow. Enjoy your music. This entry was posted on Friday, May 23rd, 2003 at 6:31 am. It is filed under Flashback Friday and tagged with Deniece Williams, Flashback Friday, This Is Niecy. You can follow any responses to this entry through the RSS 2.0 feed. wow, my mother must have played that album a milliom times. i know the words to everyone of those songs. could sing them in my sleep! i knew she was singing gospel now, but hadn’t heard anything. thanks for the links, gonna pass them on to my mom. For years, I’ve been unsuccessful finding a copy of the duet featuring Deniece Williams and Phillip Bailey’s version of “THEY SAY”. Do you know where or how I could get it? All I have are memories, but it was a beautiful rendering. One of the most under-rated singers ever. Her voice can bring tears to one’s eyes. “I’m So Proud,” is one of my favorites. “Waiting” is beautiful and of course, “Black Butterfly” is a classic. 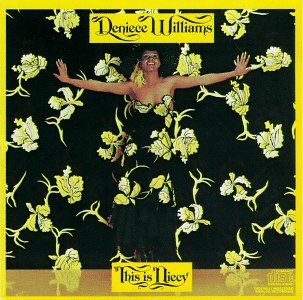 I’ve been trying to get a copy of “They Say” by Deniece Williams And Phillip Bailey for years. I’ts a gospel song. Do you know how can i get a copy of this song. i was looking for the version of “they say” with deniece and philip as well. every tape i buy is a different version. any luck? ?